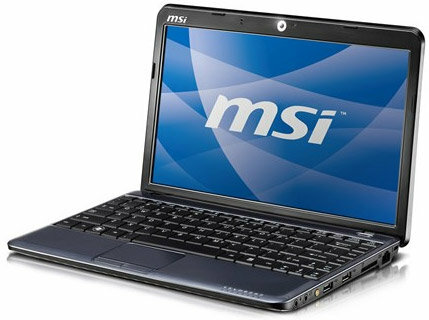 MSI announces that their Wind12 U230 netbook is now available for shipping. This AMD-powered device comes in two versions, the U230-033 and U230-040. Both models have Windows 7 Home Premium, 12.1-inch WXGA screen with 1,366 x 768 resolution, ATI Radeon HD3200 graphics, 2GB or RAM, WiFi, a 1.3-megapixel camera, and a 6-cell battery. Other specs include three USB ports, VGA/ HDMi outputs, an Ethernet port, audio ports, and a 4-in-1 card reader. The difference between the two version is that the U230-033 is powered by an AMD Athlon Neo MV-40 processor and has a 250GB HDD, while the U230-040 comes with an Athlon X2 L335 and 320GB disk drive. Both models are now available on NewEgg. The former costs US$429.99 , while you need to shell out an additional $50 to get the other version.